Location: Corbère, in the Pyrenees-Orientales departement of France (Languedoc-Roussillon Region). 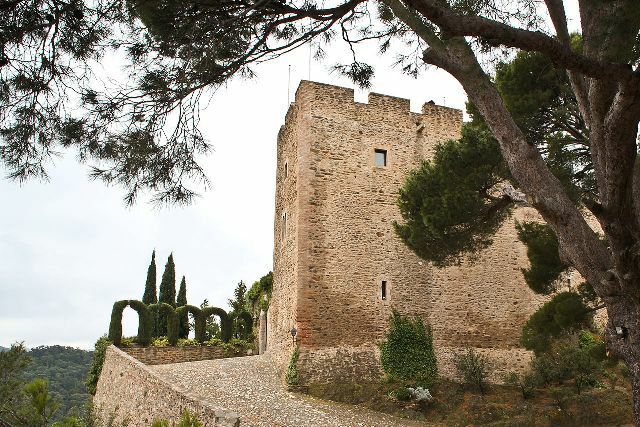 Notes: Château de Corbère is a medieval castle in the town of Corbère.Although it is mentioned for the first time in 1241 (castrum and Forcia of Corbaria), the start of construction of the castle probably dates back to the twelfth century. It was enlarged and redesigned in the thirteenth century and in the sixteenth century. It was later inhabited by families of Llupia in 1588, Villanova-Caramanyen in 1666 of Boisembert in 1680, during which disputes with villagers complexifièrent by applying increasingly difficult manorial rights, and that up 'the revolution. During the 19th century, the castle belonged to the family of Villars; after WWII, the uninhabited castle gradually fell into disrepair before being completely looted. It was not until 1970 that a Parisian publisher, Mr Andre Thiebaut certified architect, undertook to save it in the restaurant entirely with the help of the historian and archaeologist Pierre Ponsich: Realignment of roofs roof terraces, total repair of carpentry and flooring in the French, cleaning and recovery bays 19th day of bricks with a refund of the original stone mullioned windows. He lived there with his family for twenty years; his wife Madeleine Thiebaut, artist, was presenting his works and those of Catalan artists at numerous events. Purchased by the Chamber of Commerce and Industry of Perpignan, he was then sold to an American doctor very significant renovations of who effected since its acquisition in 1995. The castle is for sale since 2012. The castle is listed "historic monument" since 1974.